Who said you had to spend a fortune on ​a wedding dress? I ​for one don’t believe it. Granted, I may be a little biased as I took the risk ​of ordering my ultra affordable wedding gown ​on eBay. Affordable doesn’t mean cheap or tacky. It means you get a quality bridal gown at a price point that fits your budget. If the ​gowns on our list of Wedding Dresses under $1000 haven’t quite matched up to your dream dress, don’t worry. There are many top online shops that offer amazing wedding gowns at all different price points. Note: Prices and policies listed below are an indication only. Always check with the online shop to confirm up-to-date information. Floravere is all about eliminating appointments and salespeople, giving you the ability to try your dress on in the comfort of your home. Heck, throw a party if you want to! We absolutely love this model. Simply try on a dress at home using their bride box — free with any purchase, or $25 per gown. Molly Kang created Floravere to give brides the experience she never had: order a luxury gown that is also customizable (think color changes, additional sleeve or bows). They source the finest fabrics and materials, and each gown is designed by top artisans. After customizing your own gown through their website, it is made-to-order in 10-15 weeks. Returns: As gowns are custom-made to order, gowns cannot be returned after purchase. But with the added bonus of having tried on your sample gown, there really should be no need to return. David’s Bridal is ​a one-stop destination for everything you could possibly need for your big day – ​your dress ​or even your mom’s dress! 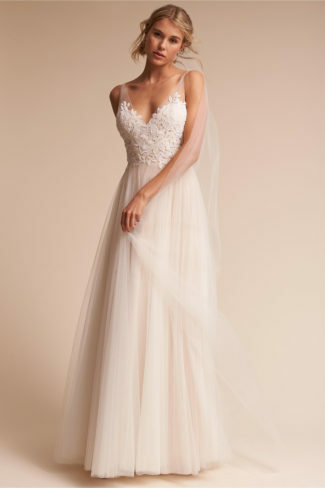 They currently offer over 375 wedding dresses under $1000, including designers like White by Vera Wang, Wonder by Jenny Packham, and Nicole Miller just to name a few. ​Lots of selection and styles that you could possibly wish for — petite, plus size, and tall ranges for those of you who struggle finding the perfect lengths and fits! Returns: DB stores are located all over North America. ​However, if you would prefer to do your shopping online and try your gown on in the comfort of your own home, they also offer a 14 day return policy. BHLDN is one of the hottest destinations for bridal gowns and guest outfits. ​Prices start at around the $300 and go up to $3000, but you have plenty to ​choose from in the ​under $1000 range. They actually have a designated category for designer wedding dresses under $1000. Currently, 77 gowns can be found in this catagory, with labels like Tadashi Shoji, Watters, and Badgley Mischka. BHLDN truly ​offers brides the ability to find a beautiful dress ​without going over ​budget. ​With a focus on weddings, they search the world for emerging designers and exclusive styles with superior craftsmanship. Returns: When you order online ​there is a 30 days return policy, along with reasonable shipping rates. One of our all time favorites. If Etsy has been your go to for everything else in your wedding decor, why not search for your wedding gown as well? There are so many talented designers who offer bespoke dresses made to your exact specification. If you just can’t find what you are dreaming of online or in person, look to Etsy to get it handmade. Returns: Be sure to check individual sellers’ reviews as well as return policy before buying. 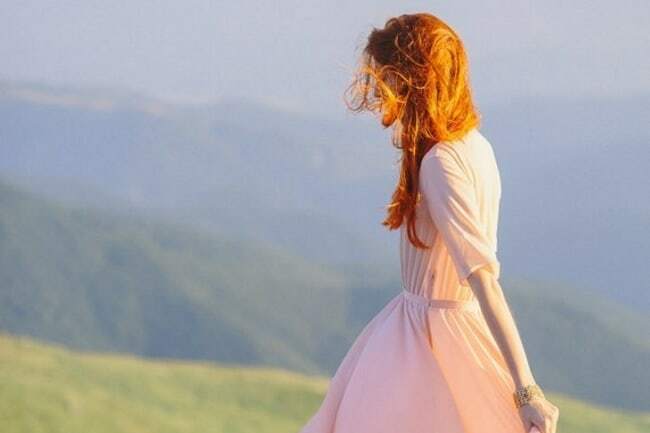 When I got married in a summertime outdoor wedding, I knew that I wanted a second dress. One that was lighter and more airy than my first gown, which was a ball gown. I ended up finding my second last minute at a store in Washington called Ross Dress for Less. It was the only one and was in my size. Talk about meant to be. TK Maxx is very similar to Ross Dress for Less, and have a wedding section online too. Not a huge selection, but enough that someone looking for a gem dress find might just get lucky. Designers like Badgley Michska, Adrianna Papell, Donna Morgan, Jenny Yoo make an appearance on this site with prices range from $29.99-599. Returns: They offer an easy 40 days return policy from the date you purchase online. Champagne taste on a beer budget? Tradsey may be just the online wedding shop for you. It’s a site for brides to sell anything from their existing closet. You can find all sorts of goodies that are in good condition, from brands like Zara to Louis Vuitton. Best of all, Tradsey have an entire wedding section. Items like sample wedding dresses, accessories, bridal jewelry, shoes, groomwear and miscellaneous wedding items. See a designer dress in the store that fits like a glove, but isn’t sensible for your budget? 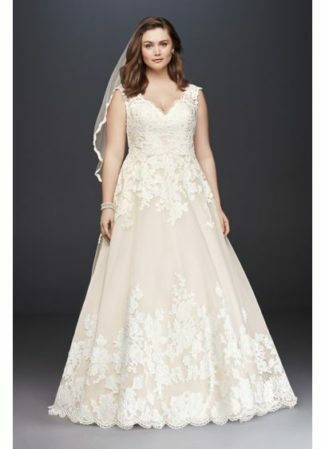 Search on Tradsey and you just might find your dream dress. Returns: You have 4 days to notify them for a return after delivery, and you can return your item for any reason for a Tradesy Site Credit. Budget: Varies – Click here to sign up and get $20.00 off your first $50.00 purchase! Founded in 1999, CocoMelody is a unique online concept where brides can easily find both ready-to-wear and haute couture options. They employ over 100 experienced seamstresses and sample makers, as well as professional in house fashion designers who can help you with you custom options. Prices range from $99-2250 and they have many dress shapes and fabric. 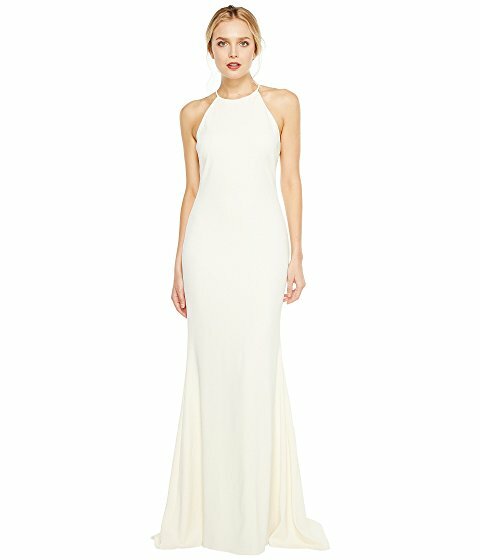 If you are looking for accessories, bridal party, or cocktail party dresses, they have those as well. Returns: Unless a custom order (final sale), you have 14 days to initiate your return after receiving it and they will be happy to help. Ever dreamt of having your own high quality bridal gown made to order? Try a company called Azazie. Each of their gowns are cut and sewn to order just for you the minute you place your order, no matter if it is a standard size or custom-sized gown. They offer many different styled dresses and have many different color options. If you are unsure about colors, fabric or fit, they also offer swatch samples and sample try-ons. They also offer bridesmaids and mother-of-the-bride dresses. Returns: Mostly custom items, it is understandable that these pieces would be final sale. Non-custom pieces must be returned within 10 days of delivery to you. 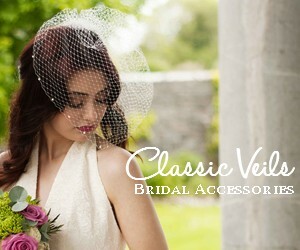 Needle & Thread are actually stocked at BHLDN, but you can find plenty more wedding dresses on their e-shop. The British brand are renowned for ​gorgeous embellishments like lace and sequins and voluminous tulle skirts. Their gowns are a very distinct style and are certainly for the bride looking to achieve a contemporary look. Returns: A 28 day return policy means that even though their sleeved gowns are just over the $1000 mark, you can still find plenty of treasures for you big day at under that price point. A Los Angeles based company, Simple Bridal, was created based on the premise of realizing that the dress is so important to a bride. 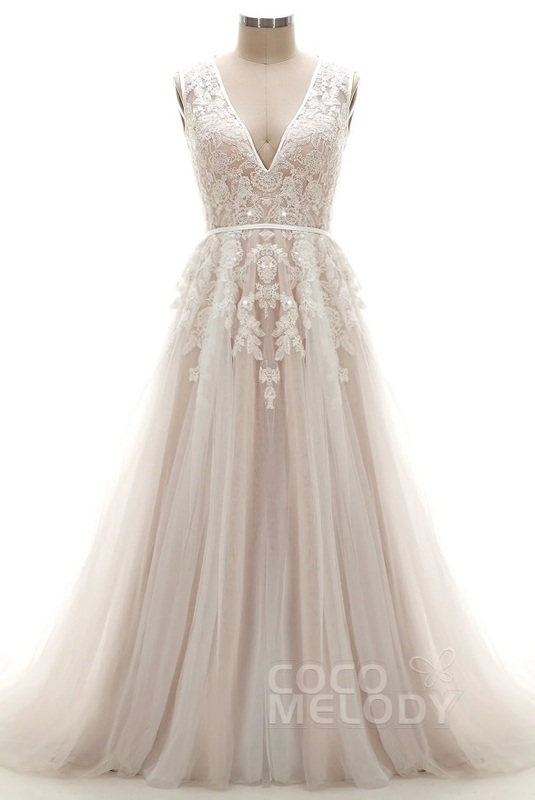 Often times the cost of that perfect gown can actually far surpass a bride’s budget. They partner with quality designers including graduates from the Fashion Institute of Technology in New York and Fashion Institute of Design & Merchandising in Los Angeles. They source only the finest fabrics and embellishments, and set the same high quality standards that are demanded by the New York fashion scene. With 166 gowns currently to choose from, you can either order a gown in a standard size or add your custom measurements. Returns: Free shipping for orders over $199 and 30 day return policy for standard sized wedding gowns. Any gowns with custom measurements are not eligible for returns. Net A Porter is one of our favorite sites for luxury purchases, but did you know they also ​sell bridal? Despite being a luxury destination, and having dresses that ​obviously exceed the $1000 mark, they have plenty that don’t. 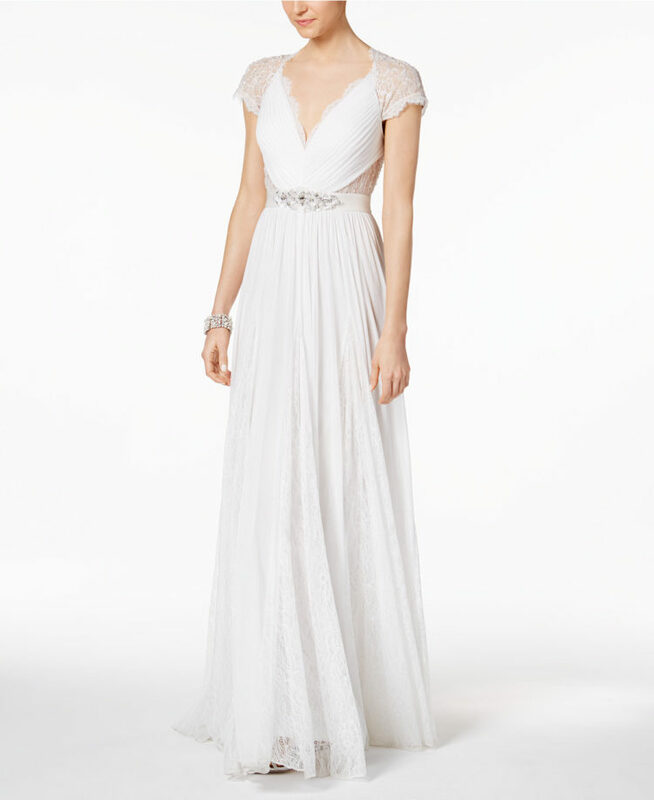 For example, this gorgeous embellished chiffon gown from Needle & Thread. There isn’t a ton of options under the $1000 mark. If you are looking for something a little different that could ​pass as bridal, they do carry beautiful maxi skirts, chiffon tops, cropped jackets, embellished capes, and classy cropped wide legged pants. Returns: They offer a 28 days return policy from the date you receive your order. Asos have started ​selling bridal wear and we can’t be any more excited! They have a perfect price range for a bride on a budget, and their dresses are quality made (especially when you look at the prices​ — all of their dresses are way under $1000). Everything from mermaid to boho dresses, and styles for petite ​or curvy brides. No matter what your personal tastes, you are bound to find a favorite on Asos. Returns: They offer a 28 day return policy. Don’t forget to check out their fab collection of beautiful hair and jewelry accessories too. 6pm have dresses priced from $15 to $2000! They have a beautiful selection for the bride-to-be, with deliciously soft, silky fabrics and elegant movement. 6pm have favorite bridal shades too – from ivory to light rose pink. 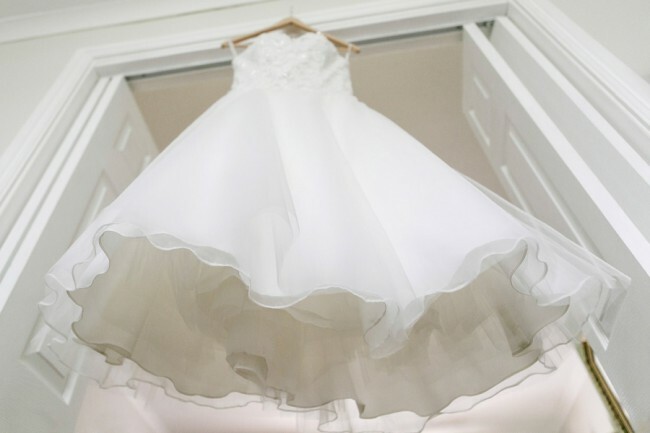 Brands like Nicole Miller, Badgley Mischka, Adrianna Papell, Calvin Klein, Donna Morgan means you are bound to find the dress for your special day! Returns: 6pm.com are happy to accept a return within 30 days of the date of purchase. Zappos offers a smaller collection of dresses with designers like Nicole Miller, Adrianna Papell and Unique Vintage. Zappos have all sorts of styles available, but they do seem to have a larger selection of knee length dresses. 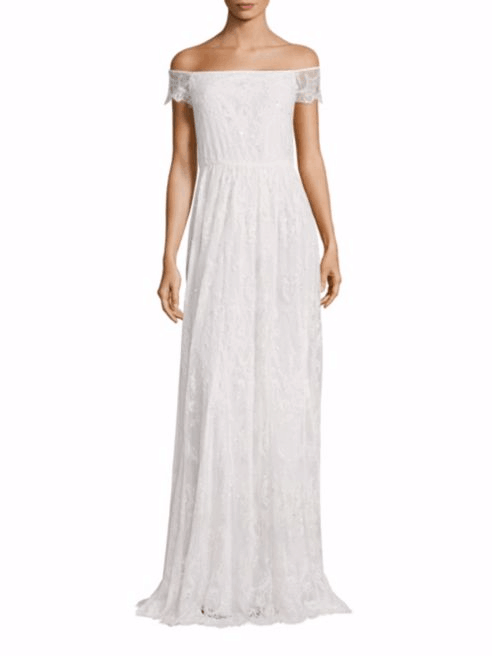 So, if you are a bride looking for a shorter vintage style dress, you may find a keeper over on Zappos. Returns: A huge bonus with Zappos is that they offer free shipping and a cushy 365 day return policy! Shop Bop doesn’t have a designated section for under $1000 gowns, but it looks like you could scoop a real bargain if you hit them at the right time. 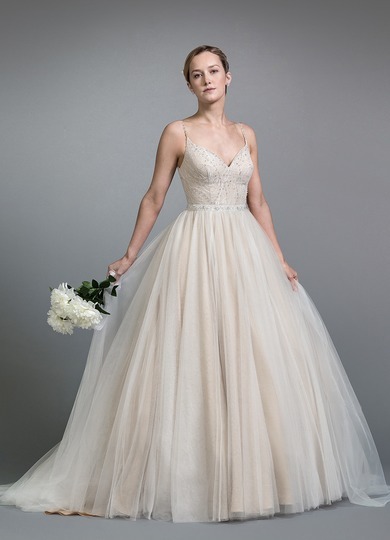 Featured designers like Monique Lhuillier, Badgley Mischka, Theia and Zac Posen offer all different styled gowns like a-line, ball gown, sheath, short, trumpet / mermaid. A good assortment of styles. Returns: They offer free shipping and a 30 day return policy. 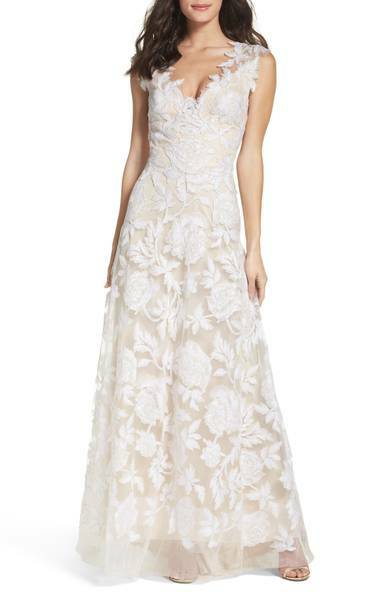 We know Nordstrom for ​stylish, luxurious pieces, but did you know they also do bridal? ​Nordstrom now offers in-store Wedding Suites where you can make an appointment with one of their wedding stylists who will help you find your perfect gown. Of course, if you can’t drop by for an in person visit, you can always order from their online wedding collection. ​Their wedding dress price ranges vary. They currently have 38 gorgeous wedding dresses in A-line, ballgown, fit & flare, mermaid and sheath by designers like PRONOVIAS, Topshop, After Six and Tadashi Shoji all under $1000. 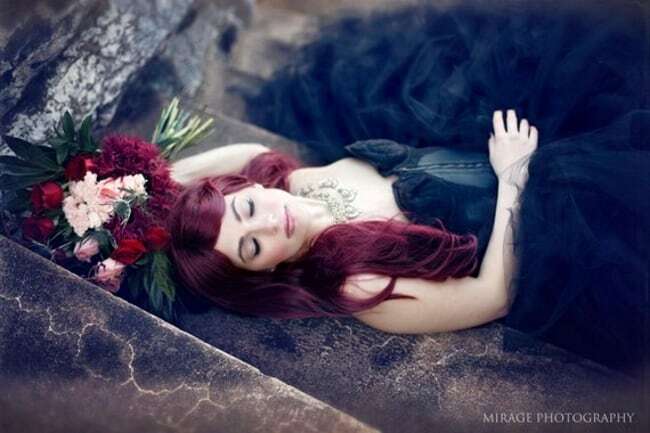 Returns: If you are an indecisive bride, you will love their extremely fair no time limit return policy. Find that perfect bridal gown and ​don’t feel rushed while you do it. Macys is proof that you don’t have to compromise quality when buying an affordable wedding dress. They ​provide for all bridal styles – shorter dresses for a bride looking for something a little more unusual, as well as more traditional styles like mermaid and halterneck gowns. Currently, it seems that they are only stocking Adrianna Papell gowns. Fine by us because her designs are exquisite! Take this Adrianna Papell’s Illusion Embellished A-Line Gown (pictured), we sure get a Jenny Peckham vibe for a fraction of the price. Returns: With 180 day return policy, you won’t be in a rush to order many gowns. Take your time and try them on at home to find that perfect one! More and more brides are opting for designer gowns for their big day — gowns that are fresh, modern and perfect for the forever stylish bride. 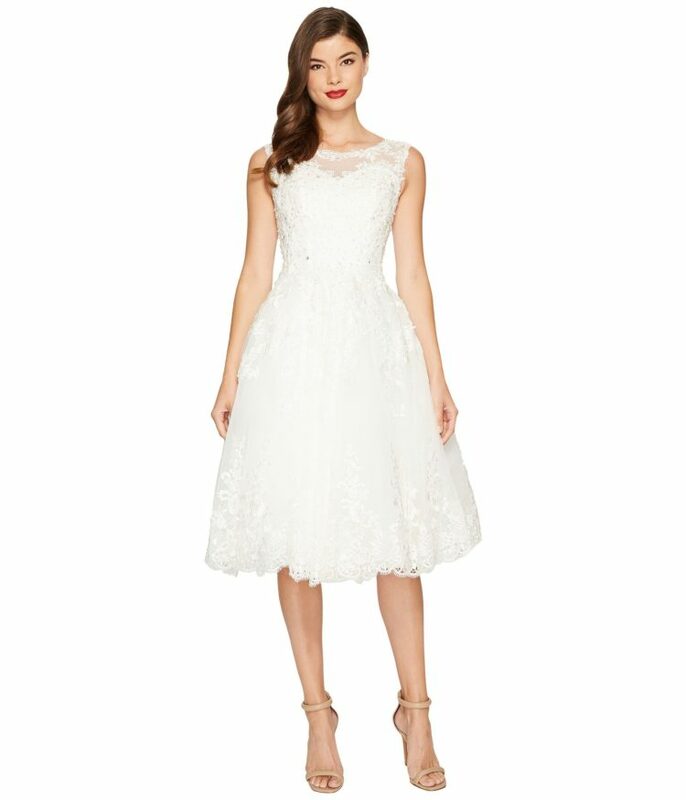 Saks Fifth have big name bridal labels such as Self-Portrait – renowned for their guipure lace dresses – along with a more vintage vibe from designer Alice + Olivia. Either way, the fashionista bride can find her favorite amongst the selection at Saks Fifth Avenue. Returns: If you are not happy, you have up to 30 days after purchase to exchange, replace, or get a credit. You may or may not have heard of House of Brides, but they are definitely worth taking a look at. They are mainly an online store, with 5 brick and mortar locations in Illinois. ​They’ve been in business for 88 years, which is pretty amazing. Carrying gowns ​at many price points, they currently have over 1445 dresses that are under $1000. With over 140 designer labels being offered, you are bound to find something special. ​A business model that has no sales staff and alterations department means they are able to pass on 80% savings off retail prices. The only downside is that all sales are final and cannot be cancelled once they have been purchased. House of Brides have the dreamiest wedding dress details – ruffles, lace, embroidery, embellishments – you name it they have it! Returns: All sales are final for special order merchandise. All other orders, you have 5 days after receiving your purchase to alert them that you would like to return the item and be issued an online credit. Whistles is a contemporary fashion brand, based in London UK. Wearable yet distinct apparel with a small wedding collection. Beautiful wedding gown designs for a bohemian or vintage bride at heart. And, with prices ranging between $999-$1399, you can find an elegant gown that doesn’t break the bank. Returns: Items can be returned within 14 days of receipt. Are you a bride looking for a gown from next-season’s looks straight from the runway? Moda Operandi is an online retailer who invites clients to pre order runway worthy gowns. For those who can’t wait, they offer an expertly curated in-season boutique. Returns: They accept timely returns of unused, unworn, unwashed, unaltered and undamaged items within 15 days from the date you received your order. 5 Peach Wedding Dresses We're Blushing Over!